The great apes will always hold a special place in our hearts -- because, well, they're basically us. That being said, it's better to marvel at the cross-species similarities from afar. Because similar or not, they're kind of terrifying up close. 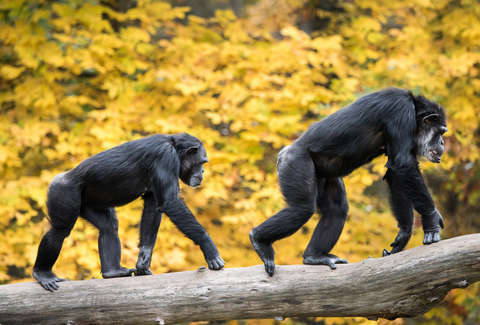 Visitors to Belfast Zoo in Northern Island got to experience our furry brethren face-to-face on Saturday, as a few enterprising chimpanzees took advantage of a fallen branch to escape their enclosure. This was all caught on video by visitors, who were equally enthralled and terrified. It's all a little whimsical in the first video. Who doesn't love a good escape plot? You can even hear a kid saying, “Don’t escape, you bad little gorilla.” Strangely, this did not convince the primate. Then it starts to seem less cute when you see the video of the chimp actually out and around the zoo. One visitor told the BBC, "I was petrified, obviously, having the kids and I tried not to show fear but inside I was a bit like what happens if it attacks us or tries to take the kids or runs over." She added, "It may have been a different story if it had been aggressive but it absolutely wasn't. It made us feel at ease. We just walked past it and it was absolutely grand."